Before Christmas a bunch of us newly-confirmed AFOLs headed up to Meadowhall as a pilgrimage to The Lego Store. It was a hugely over-exciting occasion, the likes of which will be ill-understood by those whose hearts are not similarly fired by perfectly moulded plastic bricks. We spent a lot of time billing and cooing over the many assembled models, shiny boxes and the fountain of minfigure manufacturing wonder. After much debate, number-crunching (I’d prepared a spreadsheet to calculate penny per brick and brick per penny ratios), hemming, hawing, walking away and being drawn back irresistibly to the shelf full of beautiful Lego Creator modular buildings. I was personally torn between the Fire Brigade, the Pet Shop and the Palace Cinema. They’re all gorgeous models and have a decent per brick cost. The Haunted House is stunning, as is the Ewok Village, but they are insanely expensive compared to the Creator stuff. 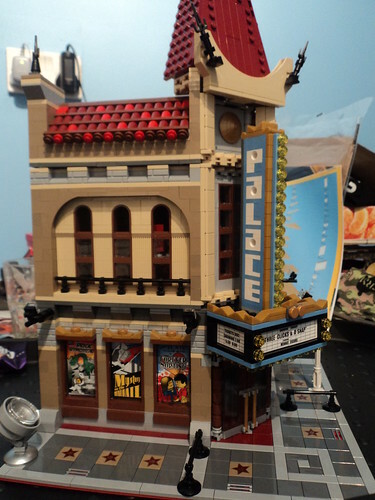 I concluded early on that the Town Hall (also beautiful and I’ve seen it assembled since at my friend’s house) was just out of my desired price range. I’ve rarely felt so tempted to blow £500 and get ’em all. I was sensible; I felt proud of myself. I chose the Palace Cinema. Partly it’s because it looks stunning on the box, and it’s a cinema and we love films. With incredible restraint we waited until after Christmas Day to begin work on this astonishing cinema. One of the reasons we got it was so that we could build it together. 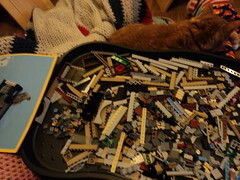 It’s really easy for me to get absorbed in Lego to the exclusion of all else. I suppose it’s much like the kids who were getting thrombosis from kneeling for twenty hours straight. I sit cross legged on a cushion most of the time, which has sort of fixed my knees until I have to stand up and realise I’ve not moved for five hours. That can hurt. I usually have a cat in my lap too. This is a lengthy build and in the end we assembled it over six nights spread over three weeks. It turns out that co-assembling Lego is more straightforward than I’d imagined. 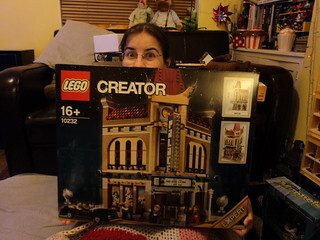 We took it in turns to brick-seek and assemble. Marilyn proved to be highly skilled at deploying the stickers for the signs and movie posters (which are brilliant). There are many pleasing details and ingenious construction throughout the cinema. 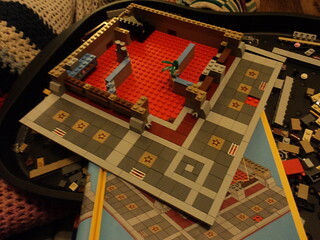 Just applying flat tiles to a third of the red baseplate was immensely satisfying. The concessions stand and the ticket office are both brilliant, and the staircases are delightful. 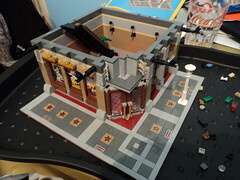 With such a large build I’d feared it would feel rather repetitive laying down yet another row of bricks, but never did. The cinema screen upstairs is very satisfying and the chairs are rather clever. It’s a bit odd that there are windows in the auditorium… Once the floors are on top of each other it’s actually pitch dark inside, which is a bit of a shame. If I were allowed to mod it (which I’m not – that’s been made quite clear!) I’d knock out huge holes in the back walls so you can see inside without taking floors off. I’d also put shutters on the screening floor windows or find some opaque windows instead. Alternatively, I’d love to do what this guy did with the custom lighting sets you can find on the interwebs. I might be allowed to do that. Otherwise I reckon this set’s on permanent display now. 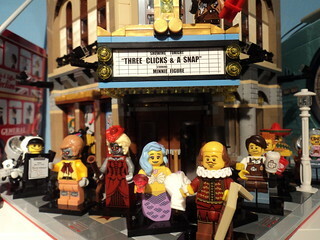 It goes especially well with the Lego Movie minifigures. I cannot wait to start this set (Friday, fingers crossed.) 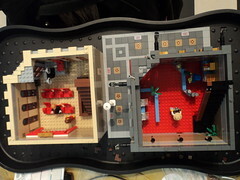 The custom lighting looks amazing but your flickr pictures gave me a better idea of how this set really looks than the Lego site. I already have a spot picked out for this when I’m done.